One of only hundreds of remaining spoon-billed sandpipers, in the Xiao Yang Kou Costa wetland, Rudong county, Jiangsu Province, China. 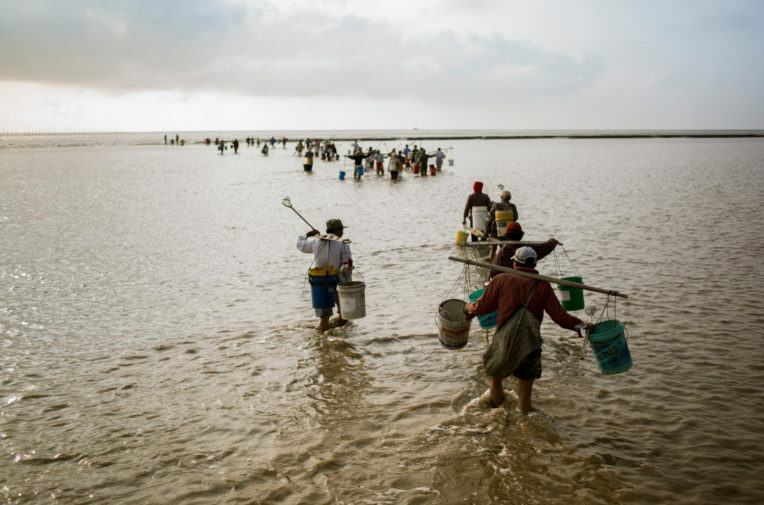 Photo: Greenpeace East Asia/Dongming Li. One of the world’s most endangered birds could be at risk because of plans to develop on rare remaining intact wetland ecosystems in China’s Jiangsu region, according to a new report by Greenpeace East Asia. 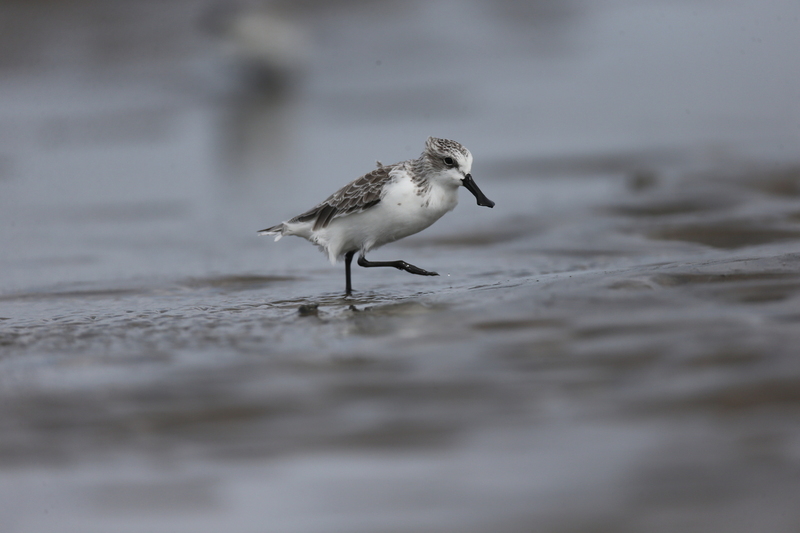 Wetlands in Jiangsu province, a coastal region to the north of Shanghai, are home to abundant bird and marine life, and serve as migratory stopovers for the spoon-billed sandpiper, a critically endangered bird which now numbers in the hundreds. Yet the wetlands used by the sandpiper are at risk from ongoing development and land reclamation, while others have experienced industrial pollution or unauthorised development, according to Greenpeace researchers who conducted field research in the region and analysed satellite imagery. The research comes after China’s leadership renewed its focus on environmental protection. The state council has ordered provinces to draw up ‘ecological red lines,’ or environmental protection zones. Experts warn that protecting the wetlands is crucial to the survival of the spoon-billed sandpiper and other species. “The Southern Jiangsu coast is the most important site in the world for migrating spoon-billed sandpiper and spotted greenshank. Two already globally threatened species that risk extinction if these sites were to be lost or degraded,” said Dr Barend van Gemerden, global flyways programme coordinator at Birdlife International. 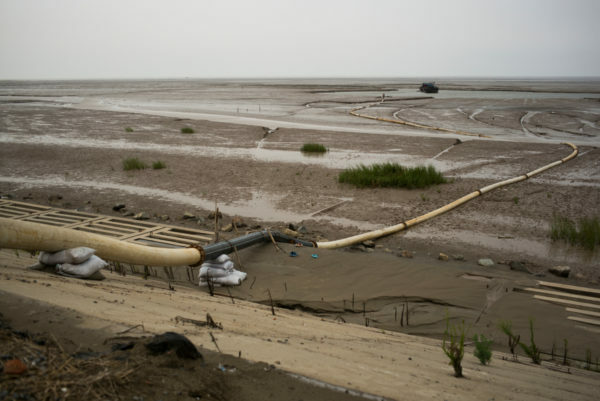 China’s wetlands are under severe pressure from encroaching urbanisation and land reclamation. Between 2003 and 2013 China lost 1.36 million hectares of wetlands to development, an area 81 times the size of China’s capital, Beijing. Since 2006 China has reclaimed 13,000 hectares of land from the sea each year, an area larger than Manchester. 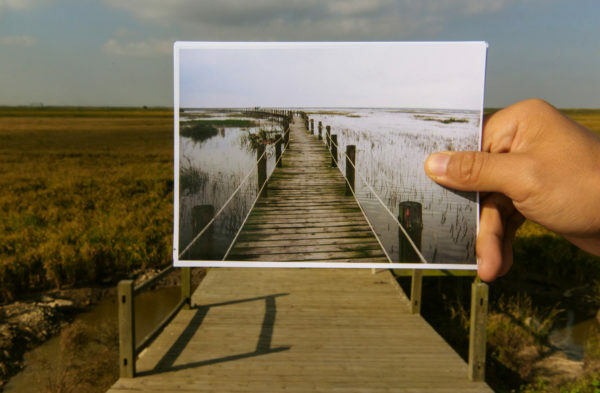 But the country’s coastal wetlands play a crucial role in limiting the impact of climate change, and are home to numerous endangered birds and 28,000 species of marine life. The government is looking to protect remaining wetlands and natural ecosystems such as forests across the country, by establishing “ecological red lines” intended to prevent destructive development. The country has also included 14 coastal sites in the Yellow Sea on its list of places to be considered for Unesco World Heritage status. 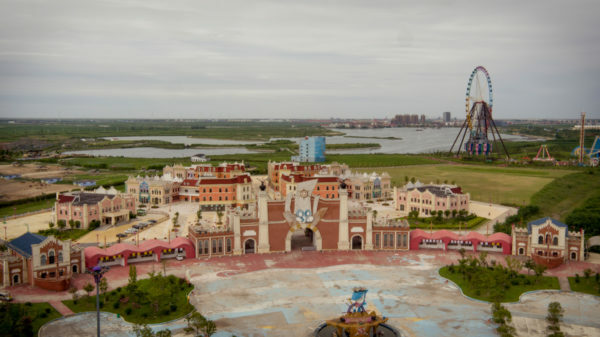 But fieldwork and satellite images from China’s Pacific coast reveals the scale of destruction up until now. Borders of previous nature reserves have been changed to allow development and may be excluded from ‘red line’ status. Other areas covered by the “red lines”, which are soon to come into force, have experienced pollution from industrial waste and unsanctioned development. The Tiaozini mudflats are home to the spoon-billed sandpiper, along with other endangered species such as the Dalmatian pelican, Nordmann’s greenshank and black-faced spoonbill. 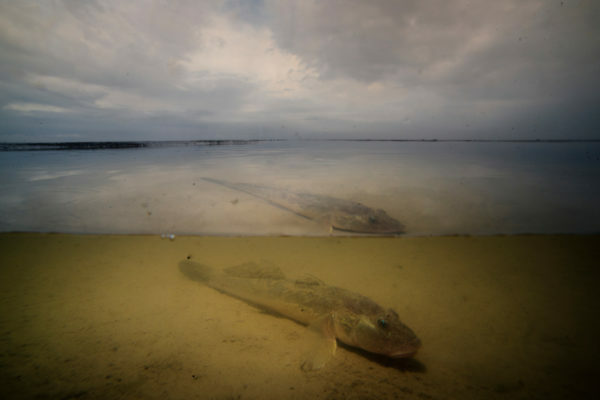 In maps published in 2007 and 2012 by China’s Ministry for Environmental Protection, the flats were included in a local nature reserve and protected from development. But by 2013, researchers found, the map had changed and the flats had been opened up for sea reclamation. So far 6,750 hectares have been reclaimed with plans to convert a further 59,950 hectares – an area more than ten times the size of Manhattan. In the plans, just 10% of that land is nature reserve – half the amount specified in a provincial law. Those wetlands left intact and within protection zones may still be hit by industrial pollution. 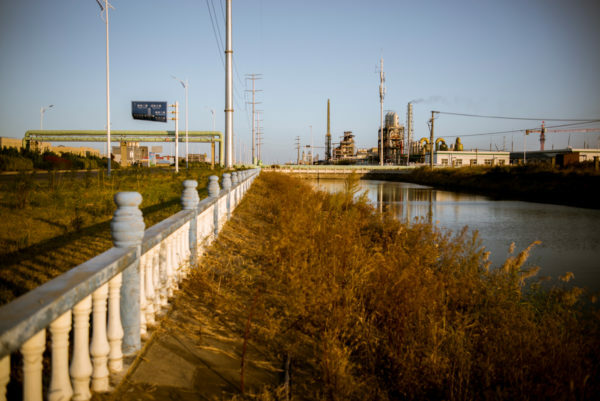 China’s “salt city” Yancheng was founded by salt harvesters and is now home to the Binhai chemical industrial park. The park, one of dozens in the region, has already been cited for failing to meet local standards on industrial wastewater. The water is discharged immediately alongside a protected area. In the same province, developers were able to build Moon Bay beach, an artificial beach situated within the nature reserve that was never authorised by local authorities. The project is currently applying for retrospective planning permission. If unchecked, the threat to China’s wetlands could push some bird species to extinction because of the crucial role the ecosystems play in what are known as migration fly-ways. “From the perspective of the birds, the quality of the flyway is only as good as its weakest link. To ensure survival and recovery of threatened migratory shorebird populations, we need to make sure that all key sites are protected and well-managed,” van Gemerden said.